• 6-week, 5 sessions/week (30 total training sessions) plan with an emphasis on Endurance and Chassis Integrity. • Strength, work capacity, TAC SEPA and Stamina are also trained. “Beretta” is the third plan in our weapons maker series of plans for full time SWAT and SRT Teams. 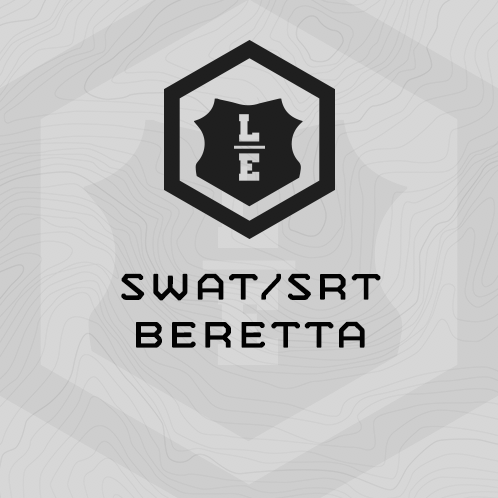 “Beretta” deploys our most recent programming theory for LE SWAT/SRT Athletes. – We deploy eccentric training for strength work in this cycle and focus on two lifts: Back Squat and Bench Press. Eccentric training = slow on the way down. For this cycle we use 5 second drops. Here’s a Eccentric Back Squat example: http://mtntactical.com/exercises/eccentric-squat/ Eccentric work generally requires a spotter. No spotter, do the lifts as normal, using the prescribed percentages. – The work capacity efforts in this cycle all deploy the same event – power cleans to shuttle sprints – but the overall event duration increases. This is perhaps my favorite work capacity event for tactical athletes. – Beretta deploys three types of Chassis Integrity circuits, all are long grinds (15-20 minutes). ART Circuits (3 core exercises – anti-rotation, rotation and total); Low Back (4 low back exercises) and; Combo (mix of low back and other core exercises). We recommend full time SWAT/SRT Teams train at their duty stations, as teams, at the beginning of the work day. We don’t believe in “big boy rules” for fitness or marksmanship. Teams should train together, do the same training, and benefit from the competition, and camaraderie which ensues. No warm up. Roll right into part (1)’s Chassis Integrity Circuit, then right into part (2)’s 2 mile IBA run assessment. (5) 15 Minute Grind …. **25m down, 25m back, 25m down, then walk back to the barbell. Once you get to the barbell, immediately start your next round of power cleans.